Ellen Thesleff (1869-1954) was a famous Finnish artist, whose paintings were on exhibition in the Tampere Art Museum some years ago. 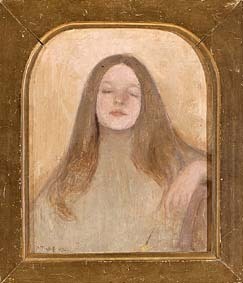 Helene Schjerfbeck (1862-1946) is probably the most famous Finnish painter. By the way, I've lived in the same apartment as she, but not at the same time. Hugo Simberg's (1873-1917) painting of the wounded angel can be seen in the cathedral of Tampere. Albert Edelfelt (1854 - 1905) is best known for his portraits of famous people, eg. Louis Pasteur and Csar Nikolai II, for his landscapes, and for his illustrations eg. in Fänrik Ståls sägner and Kanteletar. He was also the person who made Finnish art known in Europe at the end of the 19th century and the beginning of the 20th century. Eero Järnefelt (1863 - 1937) is best known for his beautiful landscapes. Like many Russian painters from the same era he also painted poor people, beggars, and sick people and their difficult life. Probably the best known of Järnefelt's paintings is Kaski (The Burn-Beating), also called 'Raatajat rahanalaiset' (Under the Yoke), where especially the girl in the middle with her hungry, swollen belly will captive you. Ferdinand von Wright (1822 - 1906) is known for his bird paintings. Hjalmar Munsterhjelm (1840-1905) was as a landscape painter a close follower of Werner Holmberg. He based his work on a worship of nature in the Düsseldorf spirit. Hjalmar Munsterhjelm wanted to see nature as a whole entity, rather as an atmosphere than a subject of realistic description. Eeli Aalto (born 1931 in Vyborg) has a very interesting exhibition, called 100 kuvaa Oulusta (100 Pictures of Oulu) in the Web. They are done between 1993 and 1998 and describe the Finnish town Oulu. There is also a diary with his thoughts from the same time. Definitely worth a visit! Pekka Halonen (1865-1933) scorned 'through-the-window-painters' and readily emphasized that the impression of cold emanating from the canvas is only attainable by those whose fingers have been benumbed by frost in the process of painting. On this beautiful painting we see his sister Lyydi washing on the ice on lake Tuusulanjärvi with the motionless houses of the nearby village in the background. 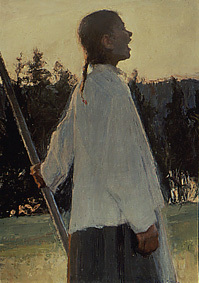 Ellen Thesleff's painting of her sister Thyra has decorated my front page for a long time, I even thought for some time that I would have it there permanently. I like this picture very much, Thyra is a very beautiful girl! Maria Wiik (1853-1928) was Helene Schjerfbeck's close friend during her student years and early career. Together they painted in France, as well as in St. Ives, Cornwall. The portrait of the artist's sister Hilda Wiik (1881) was accepted into the Paris salon, a kind of maturity test for artists.